The Antigua and Barbuda Tourism Authority office in Germany is celebrating after being awarded the prestigious Globus Award 2009 for its first online destination course. A significant achievement since the course was only recently introduced in the summer of 2009 and is the first destination e-learning course of its kind on Antigua & Barbuda in the German speaking market. The Globus award, a brand new award, is selected by travel agents and readers of “Touristik Aktuell”, one of Germany’s leading travel trade magazines. About 750 travel agencies participated in the voting. Over 1,500 votes were cast in three categories; best service for travel agencies, destination e-learning courses and road shows. There was no pre-selection by the publication and travel agencies voted for over 120 destinations. Antigua & Barbuda won third place in the E-learning category. First place was taken by Grenada, second by Ireland. Both destinations have very extensive programmes which have been in the market for many years. 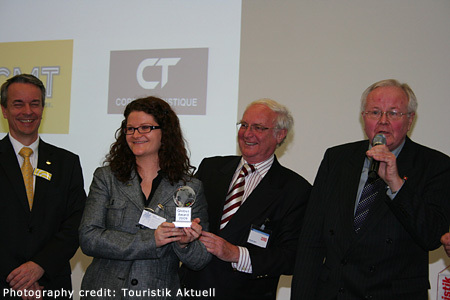 The award was presented to Dr. Werner Giersch (far right) and Sabrina Luetcke of the ABTA office in Germany. Since its introduction in 2009 approximately 980 travel agencies have participated in the Antigua and Barbuda e-learning course which is designed to improve agents’ knowledge of the destination. Information gained from the course ensures the agents are better equipped to sell the destination. The course covers the essentials of history, people, activities, events and sightseeing. Two courses plus two questionnaires must be completed by the agents in order to become a certified “Antigua and Barbuda Expert”. The top ten sales agents will be invited to visit Antigua & Barbuda for a familiarisation trip planned for April 2010. This page, and all contents of this Web site are Copyright (c) 1996-2014 by interKnowledge Corp., New York, NY. All rights reserved.